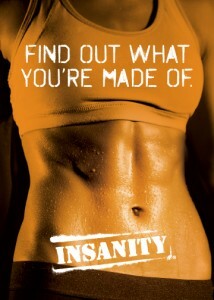 Insanity classes are held with Chantal every Tuesday evening at the Desborough Boys College. 50 minute class @6:30pm £45 for six weeks, that’s only £7.50 per session. Single drop in rates also available. If you’ve ever been to a Spin class, you know how that works. You motor along at a moderate pace for awhile – then all at once, you kick up your speed and heart rate – just for a minute or so. After that, it’s back to a lower gear, giving you plenty of time to catch your breath. But with INSANITY, you do exactly the opposite. You work flat out in 3 to 5-minute blocks, and take breaks only long enough to gulp some air and get right back to work. It’s called Max Interval Training, because it keeps your body working at maximum capacity through your entire workout. Class attendees have clocked a whopping 500 plus calorie burn in just 50 minutes. Add this to your weekly exercise regime and reach those fitness goals in no time at all.